If you've been out to the practice range lately, you might notice this new box, and you're probably asking yourself why is it there, and what is it for? If you open it, you'll notice it has tees in it. Yes these tees are for your use. You might notice they are used tees. Yes we are recycling used, unbroken tees which we pick up every morning as we set up the range tee area. Check out this picture of the bucket which sits in front of the cart we use for course set up each day. 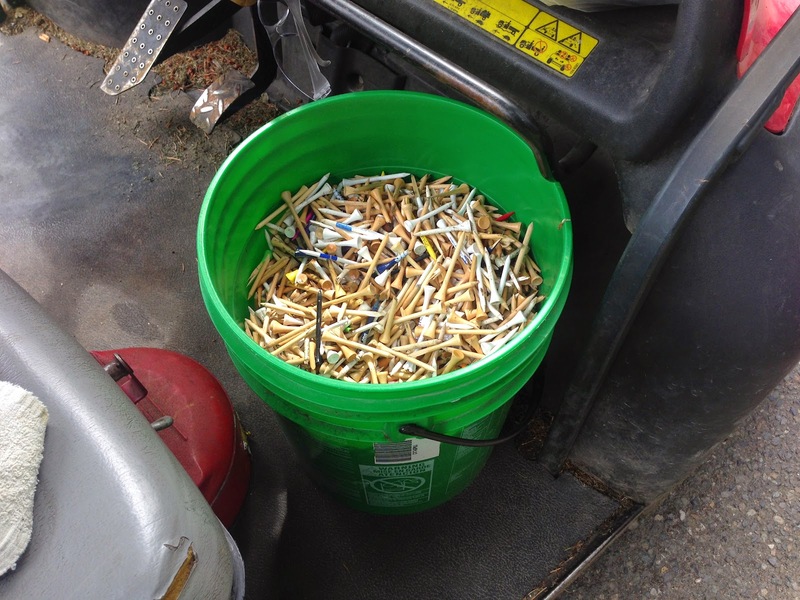 Believe it or not this full bucket of tees is what we picked up off the range tee in one month. Many of these tees are unbroken and perfectly good so in the interest of generating less waste, we have picked out the unbroken tees so that they can be used again. So please feel free to use the tees in the new box. Once all the tees are gone we will probably remove the box until we have picked up a large number of used tees again at which time we will bring the box back up so that they can be recycled. So now if your wondering why the box says "Hole 6" and "bogey 3".............then keep reading. 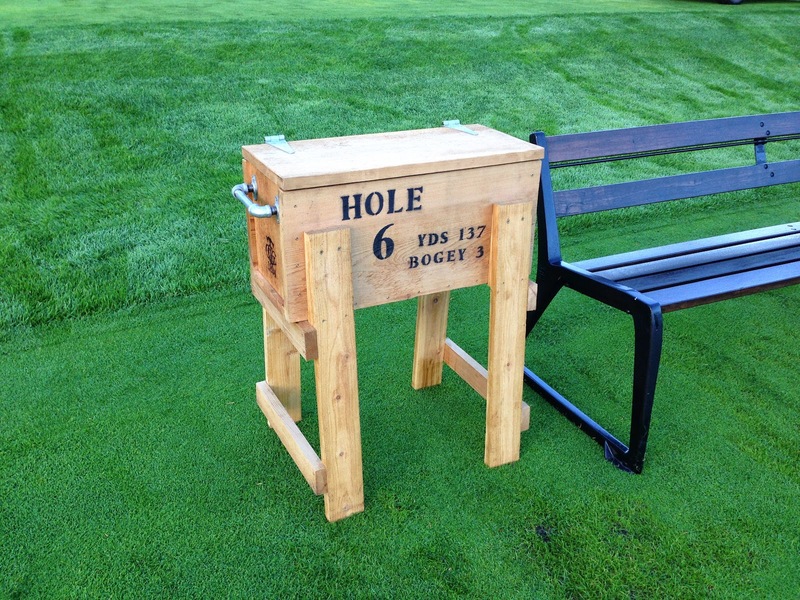 By the way, Jim the clubhouse maintenance guy built this box for me, and I just have to say we are very lucky to have Jim at the Club. He is so talented and knows just about everything about everything. Not only that, Jim is just a great guy. Anyway, the box is modeled after the one in this picture which was taken at the Club sometime in the 40's or 50's. Not really sure. 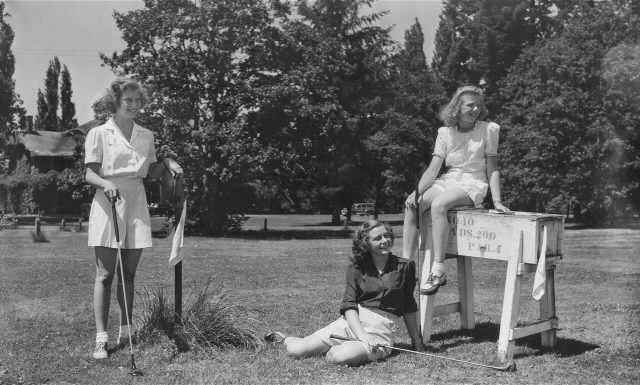 I've always loved this picture of 3 young ladies in front of what we call the "Grand Old Lady" (clubhouse 1910-1962). Anyway, the box in the picture looks like it was pretty old at the time and may have at one time served as a box for making sand tees. 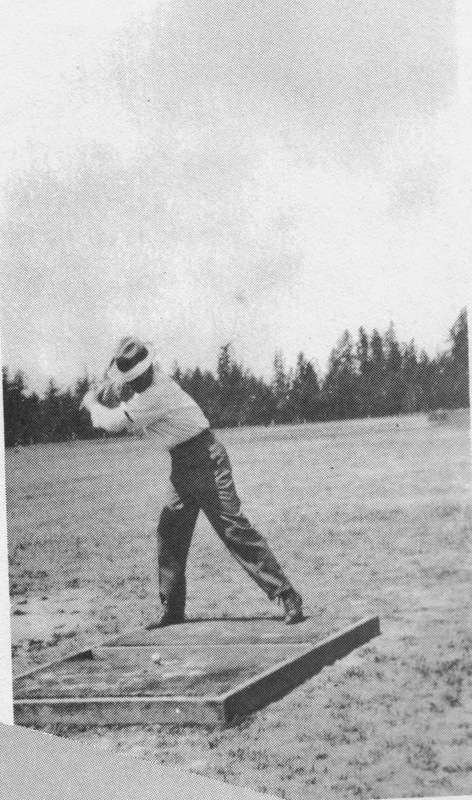 Okay maybe you didn't know this but ...... before the invention of the wood tee, balls were teed up on little heaps of sand which was provided on each tee in a box. 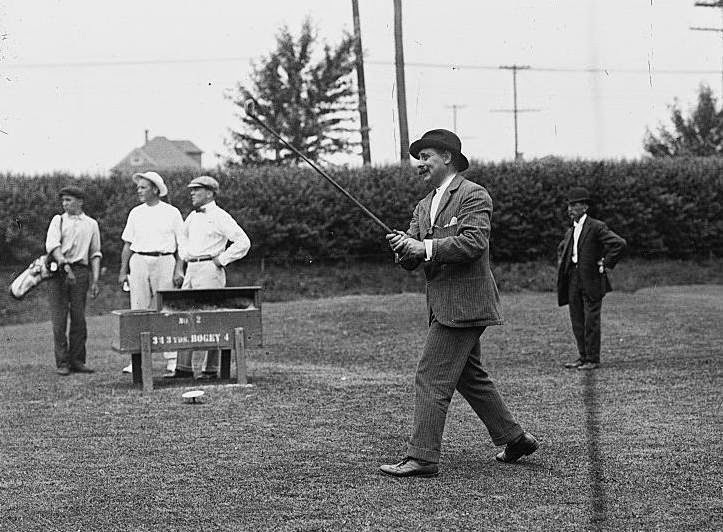 Here's a great picture of Harry Vardon teeing off next to one of these boxes. 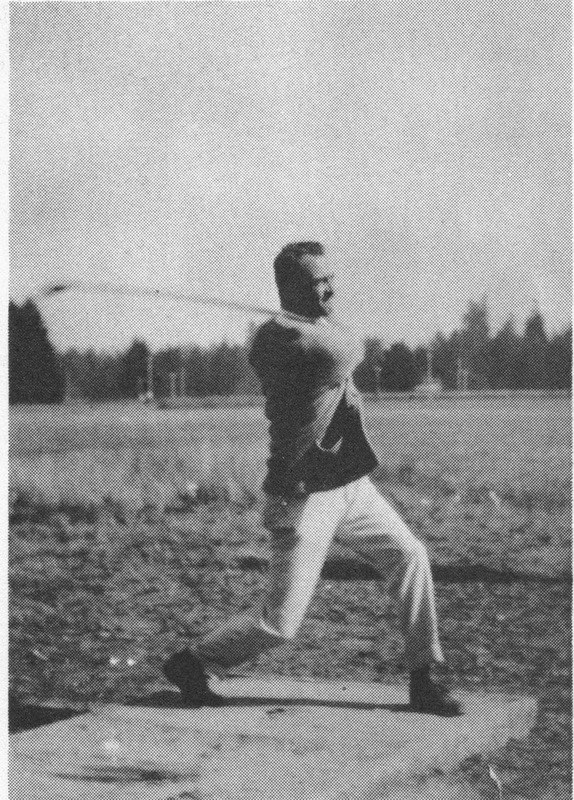 This next pic was taken at Tacoma during the same period and you can see the tee box is pretty small and more simple. I love how the first two boxes I showed you also served as tee signs. Notice both of those examples display the hole number, hole yardage, and hole par or bogey. So now you may be asking yourself why would you display a holes bogey score? Here in lies yet another history lesson for some of you. Check out this picture of Tacoma's 1925 scorecard. On the right side of the left column you can see there is par and bogey for each hole. At the top of the card you can see that the par for the course is 72 and the bogey is 81. You see in those days the term "bogey" had a different meaning. Originally, the term "bogey" was the ideal target score that an amateur would achieve, in the same way that par eventually became the ideal target score for professionals. It is now most commonly used to denote a score of one stroke over par, however many golf courses to this day have separate bogey scores for their holes, some may be par and some may be one over par. 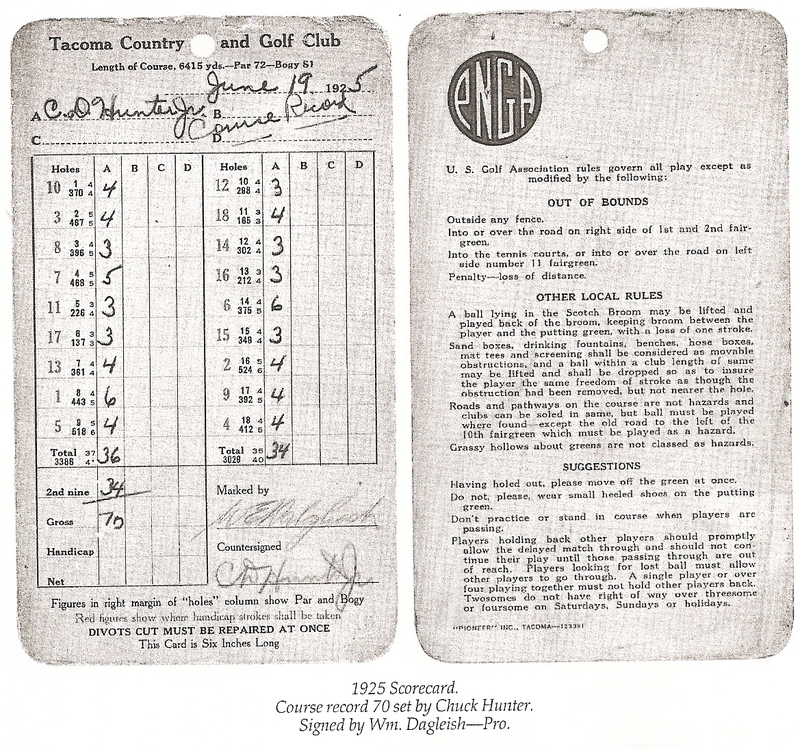 In those days, the bogey score was kind of a measure of the courses difficulty. If you could beat the bogey score, you had a good round. So anyway, some golf historians would say that these boxes on the tees in the early days is where the term "tee box" got its start. I'm not so sure. 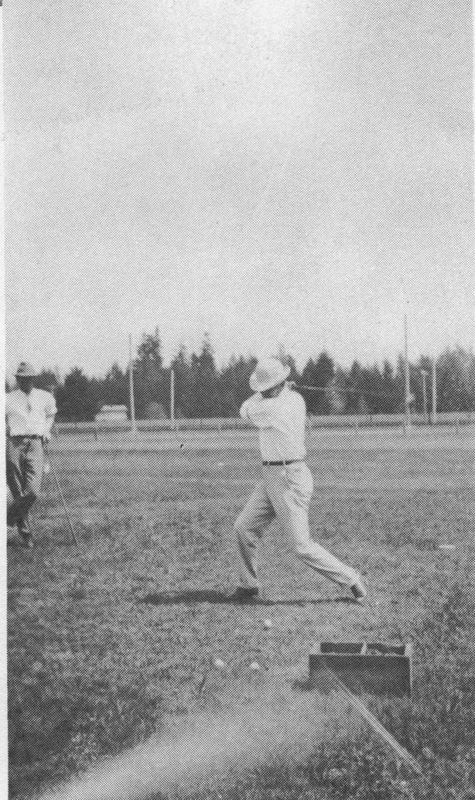 Looks at these next few pictures of golfers teeing off during the early years at Tacoma. This is before they had multiple teeing grounds. When the course was first laid out, everyone teed off from the same spot, regardless of your skill level. You can imagine growing good turf on a teeing ground would be very difficult if everyone stood in the same spot, not to mention that at that time there was no irrigation either. So people teed off from these boxes. Half of the box was a area to stand on with some sort of mat or carpet maybe. The other half of the box was a sandy soil where you would just grab some sand and heap it up for a tee. I think that these boxes where people hit from might be where the term "tee box" came from. I'm hoping that some golf historian might read this and let me know which tee box came first. 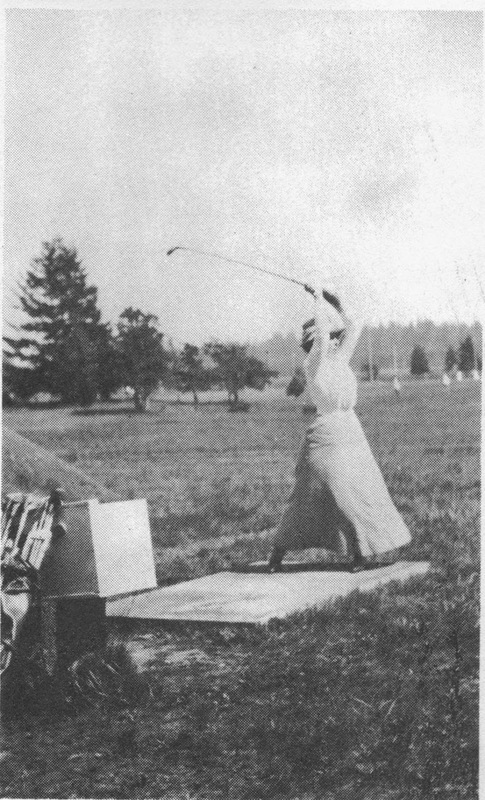 This picture shows a lady teeing off of a tee box next to a tee box. 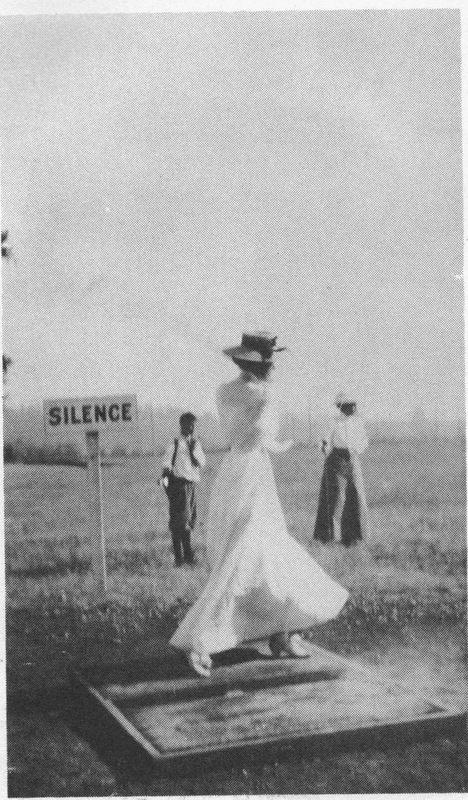 Notice these great old pictures clearly show that the original golf course property was really an open prairie. This guy was really crushing the ball off the tee box. So anyway, back to the tee box on the range. I originally had it built so that people could try making sand tees to hit off, just for fun. My intention was to set it out on #6 so that is why it has "Hole 6" displayed on it. I also selected hole #6 because I thought it was pretty neat that it is a par 3 and also a bogey 3 at the same time. 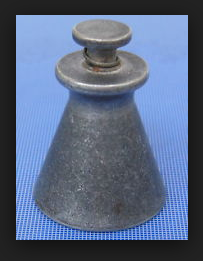 The only reason I haven't followed through with putting out the box on hole #6 is that I am having a very hard time finding an inexpensive sand tee mold. Here's a couple of examples of a sand tee mold. 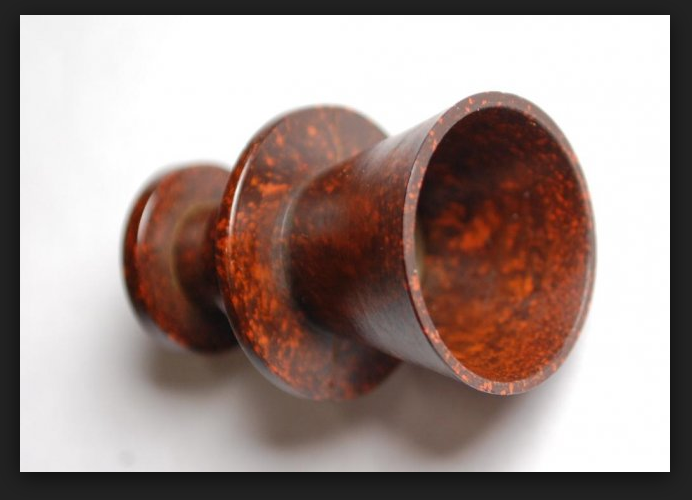 These little babies where used to make the sand tees and it is kind of hard to find replicas of them. Authentic sand tee molds are really expensive. 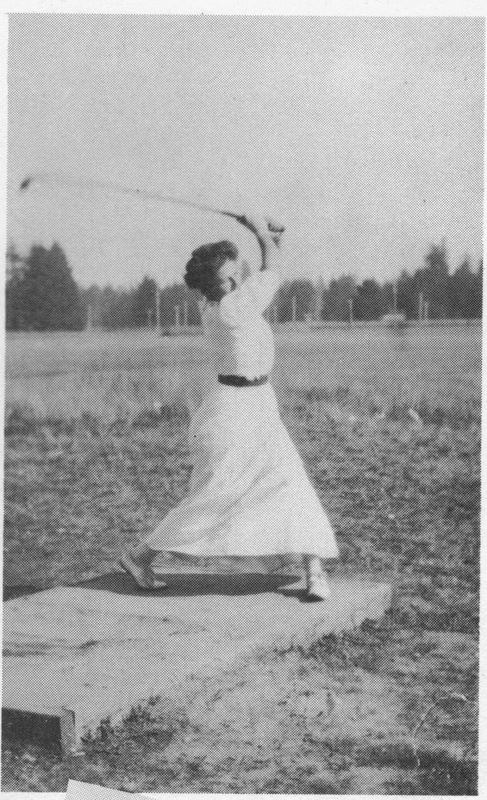 Who know, maybe some time I will find some inexpensive replicas that I can put out on the course so we all can try to hit off an actual sand tee, just like they did here 100 years ago.